We've compiled an RV glossary for those wanting to master the terminology of the RV world. Every industry has their own lingo and Rving is no different. 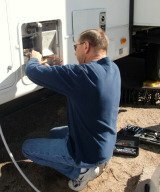 There are hundreds of words describing RV issues, parts, and important information. Are you fluent in the RV language? See how many RV terms you are familiar with. Towing an Air stream travel trailer. Shock absorber at the front and rear axles of a motor home. Used in a water heater attracts corrosion causing particles in the water. Particles attack the anode rod instead of the metal tank. The anode rod should be inspected yearly and changed when reduced to 1/4 its original size. The rods are used in steel water heater tanks - an aluminum tank has an inner layer of anode metal to accomplish the same thing. Anode rods should not be installed in an aluminum tank. Also spelled Arctic Pac and Arctic Pak, an optional kit to insulate RVs for winter camping. Extra battery to run 12-volt equipment. The final drive gear ratio created by the relationship between the ring and pinion gears and the rotation of the driveshaft. In a 4.10:1 axle ratio, for example, the driveshaft will rotate 4.1 times for each rotation of the axle shaft (wheel). Video camera mounted on rear of motor home to assist the driver visually with backing up the motor home, with a monitor mounted in the driver's area of the cab. Also can monitor traffic behind the motor home and any vehicle in tow. Large storage areas underneath a raised RV chassis. Sewage from the toilet is flushed into a black water holding tank, generally located beneath the main floor of the RV. Plastic portable waste holding tank generally in a bright shade of blue. Parked in an RV without benefit of electricity, fresh water, and sewer utilities. Many people boon dock in WalMart parking lots. The motor home living space on a class A, built from the chassis up. Safety device that activates the trailer brakes in the event a trailer becomes accidentally disconnected while traveling. British Thermal Unit ; A measurement of heat that is the quantity required raising the temperature of one pound of water 1 degree F. RV air-conditioners and furnaces are BTU-rated. Term used to describe a variety of conditions; the level of RV when parked, referring to a bubble-leveler tool. Also describes a delaminating condition. term for the tendency of a wheel to steer as it moves upwards into jounce. Bracket with a ball mounted to the bumper on tow vehicle. These hitches have very limited RV applications. Slang term regarding the hitch or towing method for a conventional travel trailer or popup; receiver and ball-mount type hitch. Overlapping top of a Class C motor home. Generally sleeping area in older models and storage or entertainment area in newer models. Cargo Carrying Capacity, Maximum weight of everything you are carrying in your RV. Battery in motor home for operating 12 volt components. Built on a truck chassis with an attached cab section, which is usually van based, but may also be pickup truck based or even large truck based. They are characterized by a distinctive cab-over profile, the "cab-over" containing a bed or an "entertainment" section. Also referred to as "mini-motor homes". In the UK, the cab-over is known as a Luton. Driver and front passenger area of a motorized RV. A device for changing 120-volt AC into 12-volt DC electrical power. Trailer part that connects to the hitch ball. Furniture arranged side to side rather than front to rear of the RV. The side of the RV facing the curb when parked. Also known as "knock" or "ping," this is a condition in which some of the unburned air/fuel in the combustion chamber explodes at the wrong time in the ignition cycle, increasing mechanical and thermal stress on the engine. Motor home with a diesel engine in front. Motor home with a diesel engine in rear. A booth like dining area in which the table may be lowered to convert into a bed. A vehicle towed behind a motor home, sometimes with two wheels on a special trailer called a tow dolly, but often with all four wheels on the ground. Also called unloaded weight is the manufacturers estimate with no passengers, fuel, and water or supplies onboard. Direct Spark Ignition; The method of igniting the main burner on a propane-fired appliance. The burner is lit with an electric spark and the flame is monitored by an electronic circuit board. This ignition system is used in refrigerators, furnaces and water heaters. Usually a concrete pad with an inlet opening connected to an underground sewage system at a campground or other facility offering dumping service to RVs. Dry weight; The manufacturer's listing of the approximate weight of the RV with no supplies, water, fuel or passengers. A heat exchanger, similar to a small radiator, through which engine oil passes and is cooled by airflow. A hitch that utilizes spring bars that are placed under tension to distribute a portion of the trailer's hitch weight to the tow vehicle's front axle and the trailer's axles. The hitch is also known as a weight-distributing hitch. Designed to be coupled to a special hitch that is mounted over the rear axle in the bed of a pickup truck. These trailers can have one, two or three axles and are the largest type of trailer built. Because of their special hitch requirements, fifth-wheel trailers can only be towed by trucks or specialized vehicles prepared for fifth-wheel trailer compatibility. Other name for fifth wheel. Class II and higher hitches are designed to be bolted to the vehicle frame or cross members. This type of hitch may have a permanent ball mount, or may have a square-tube receiver into which a removable hitch bar or shank is installed. Water suitable for human consumption. Term for campground accommodations offering water, sewer/septic and electricity; also refers to a RV with the abilities to use 'full-hookups'. Living in one's RV all year long. RVers are known as full-timers. When powered, initiates gas valve opening and spark sequence which lasts approximately seven seconds. Newer boards are three try (i.e., will attempt to ignite three times at approximately 60 second intervals). Older models are single try. Angled tub with wide edges around corners to bathroom items. Slang for rear gasoline engine mounted chassis on motor home. Dinette bench or sofa that converts to a sleeping area. Newer units have air mattresses in the sofas. Gross Axle Weight Rating; Maximum weight per axle with weight distributed evenly on the vehicle. Gross axle weight rating; Maximum to which the axle can be loaded, according to the manufacturer; includes all weight placed on all tires on a given axle. Gross Combination Weight Rating; Maximum weight for the combination of tow vehicle, RV, passengers, water, fuel, propane, and everything on board. Gross combination weight rating; Maximum allowable combined weight of the tow vehicle and the trailer, according to the vehicle manufacturer; includes the weight of vehicles plus all fuel, water, supplies and passengers. Waste water from sinks, and shower. Generally held in a separate tank from black water. Gross Trailer Weight; Gross trailer weight is the weight of the trailer fully loaded in its actual towing condition. GTW is measured by placing the fully loaded trailer on a vehicle scale. The entire weight of the trailer should be supported on the scale. Gross Trailer Weight Rating; Maximum allowable weight of a trailer, fully loaded with cargo and fluids. Gross Vehicle Weight Rating; The manufacturers maximum load weight, in pounds, allowed for the vehicle. This rating includes the weight of the vehicle plus fuel, water, propane, supplies and passengers and hitch weight. DOT regulates GVWR to a maximum or 26,000 lbs unless you have a CDL (Commercial Drivers License). An electric heating element located in the air conditioning system with the warm air distributed by the air conditioner fan and ducting system. They are typically 1500 watt elements (about the same wattage as an electric hair dryer) and have limited function. Amount of a trailer's weight that rests on the tow vehicle; should be 10 to 15 percent with conventional trailers, 15 to 20 percent for fifth-wheels. Connections to a campground's facilities. The major types of hookups are electrical, water and sewer. Hookups may also include telephone and cable TV in some campgrounds. Full hookups refer to a combination of water, electricity and sewer. Battery or batteries in motor home for operating the 12-volt system within the motor home, separate from the chassis. Abbreviation for Holiday Rambler, a well-known RV manufacturer. Term used for a type of dirt skirt accessory some RVers use on the back of their motor home to aid in the protection from debris thrown from their rear wheels to the vehicles directly behind them or being towed behind them. This dirt skirt is usually the length of the rear bumper and resembles a 'short' version of a Hawaiian 'hula-skirt', hence the term. 90% angle obtained from turning/backing fifth wheel or travel trailer with tow vehicle. Jackknifing a short bed truck towing a fifth wheel without the use of a slider hitch or extended fifth wheel pin box can result in damage to the truck cab or breaking out the back window of the truck cab from the truck and fifth wheel "colliding". Kampgrounds of America, a franchise chain of RV parks in North America that offers camping facilities to vacationers and overnighters. Kilowatt; A measurement of electrical power; each kilowatt equals 1,000 watts. RVs that are designed to be easily towed behind most Minivans, light-duty trucks and cars! The most common being a pop-up trailer. Also called Feather Weight in some models. Propane; abbreviation for liquefied petroleum gas, which is a gas liquefied by compression, consisting of flammable hydrocarbons and obtained as a by-product from the refining of petroleum or natural gas. Also called bottled gas, LPG (liquid petroleum gas) and CPG (compressed petroleum gas). Term for motor home on "bus-type" chassis. Abbreviation for National Automotive Dealer's Association. Net Carrying Capacity; Maximum weight of all passengers (if applicable), personal belongings, food, fresh water, supplies -- derived by subtracting the UVW from the GVWR. Folding camping trailer. Also known as a folding trailer, great for first timers due to its simplicity and relatively low cost. A term used to define an up and down motion with a RV. Also known as "dry camping", boon docking. Camping without the modern convenience of full-hookup facilities of city/well water, sewer/septic and electricity. Primitive campers rely on 'on-board' systems for these conveniences; generator, batteries, stored water, etc. LPG or liquefied petroleum gas, used in RVs for heating, cooking and refrigeration. Also called bottle gas, for manner in which it is sold and stored. A campsite that allows the driver to pull into the site to park, then pull out the other side when leaving, without ever having to back up. Slang for "refrigerator". Refrigerators are often found in either a "two-way" or "three-way" operating mode. Two-way: Have a gas mode and an AC mode. Three-way: has a gas mode, AC mode, and 12v DC mode. The coolant used in RV refrigeration is ammonia. The two most common manufacturers of RV refrigerators are Norcold and Dometic. Air conditioning unit mounted on the roof of an RV to cool the unit when it is parked. When moving, most RVs are cooled by air conditioning units which are components of the engine. Recreational Vehicle; A motorized or tow able vehicle that combines transportation and temporary living accommodations for travel, recreation and camping. RVs come in all shape and sizes for any budget or need. They range from camping trailers costing a few thousand dollars to luxurious motor homes with prices well into six figures. RVs refer to multiple RV and RVers refer to their owners. A set of chains that are attached to the trailer A-frame and must be connected to the tow vehicle while towing. Safety chains are intended to keep the trailer attached to the tow vehicle in the event of hitch failure, preventing the trailer from complete separation. They should be installed using an X-pattern, so the coupler is held off the road in the event of a separation. Electricity provided to the RV by an external source other than the RV battery. The part of the vehicle on the street side when parked. Fishtailing action of the trailer caused by external forces that set the trailer's mass into a lateral (side-to-side) motion. The trailer's wheels serve as the axis or pivot point. Also known as "yaw." Motor homes built on chassis with short wheelbases and long overhangs behind the rear axle are susceptible to tail swing when turning sharply. As the motor home moves in reverse or turns a corner, the extreme rear of the coach can move horizontally and strike objects nearby (typically road signs and walls). Drivers need to be aware of the amount of tail swing in order to prevent accidents. Appliances that can operate on a 12-volt battery, propane, or 110-volt electrical power. Term for room (generally in older RVs) that "tipped-out" for additional living space once RV was parked. Newer RVs mainly use 'slide-out' rooms. A device used for connecting a toad/dinghy vehicle to the motor home when it's towed with all four wheels on the ground. A car towed by an RV to be used as transportation when the RV is parked in a campground. A low, wheeled frame with a platform used for carrying heavy objects. Motor home owners often use tow dollies to haul a car or SUV behind their RVs. The manufacturer's rating of the maximum weight limit that can safely be towed by a particular vehicle. Tow ratings are related to overall trailer weight, not trailer size, in most cases. However, some tow ratings impose limits as to frontal area of the trailer and overall length. The vehicle manufacturer according to several criteria, including engine size, transmission, axle ratio, brakes, chassis, cooling systems and other special equipment, determines tow ratings. Brakes that are built into the trailer axle systems and are activated either by electric impulse or by a surge mechanism. The overwhelming majority of RVs utilize electric trailer brakes that are actuated when the tow vehicle's brakes are operated, or when a brake controller is manually activated. Surge brakes utilize a mechanism that is positioned at the coupler that detects when the tow vehicle is slowing or stopping, and activates the trailer brakes via a hydraulic system (typically used on boats). A heat exchanger similar to a small radiator through which automatic transmission fluid passes and is cooled by airflow. Tongue Weight; The amount of weight imposed on the hitch when the trailer is coupled. Also referred to as "hitch weight". Tongue weight for a travel trailer can be 10-15 percent of overall weight; fifth-wheel hitch weight is usually 18-20 percent of the overall weight. The wiring harness that connects the tow vehicle to the trailer, supplying electricity to the trailer's clearance and brake lights, electric brakes and a 12-volt DC power line to charge the trailer's batteries. An umbilical cord can also be the power cable that is used to connect to campground 120-volt AC electrical hookups. Uniform Tire Quality Grade Labeling; A program that is directed by the government to provide consumers with information about three characteristics of the tire: tread wear, traction and temperature. Following government prescribed test procedures, tire manufacturers perform their own evaluations for these characteristics. Each manufacturer then labels the tire, according to grade. UNLOADED VEHICLE WEIGHT; Sometimes called the Dry Weight; it is the weight of the RV without adding fuel, water, propane, supplies and passengers. The manufacturers UVW will not include any dealer-installed options. A fully loaded van and the smallest of the fully enclosed motor homes. These are constructed on a van chassis with elevated roof lines but no modifications to the length or width of the original chassis. Gross vehicle weights are in the 6000 to 8000 range with heights of 7 to 8 feet and lengths of 17 to 19 feet. A leader, either hired or chosen, who guides a caravan of recreational vehicles on a trip. The wagon master usually makes advance reservations for campgrounds, shows, cruises, sightseeing and group meals. Also known as a "dead-weight" hitch, this category includes any system that accepts the entire hitch weight of the trailer. In the strictest sense, even a weight-distributing hitch can act as a load-carrying hitch if the spring bars are not installed and placed under tension. Designs that stretch RVs from the traditional 96-inch width to 100 or 102 inches. Nickname for Winnebago, a well-known RV manufacturer.